Given my blog’s name, you might be forgiven for expecting my first food-related post to be about cauliflower, however quite surprisingly I find myself without any on the menu today. What I do have is celeriac dauphinoise. The celeriac is a very underrated vegetable. It would undoubtably get more press if it was prettier; I often think it looks like a brain that has somehow escaped from its jar. Luckily I have a very sharp knife, so feral jar-escaping pseudo-brains aren’t a major concern. Celeriac makes a great low-carb substitute for potato in the French classic dauphinoise. Now, don’t expect celeriac to taste like potato; it has its own particular charms. It’s a little like celery, but not obnoxiously so, and a little nutty, too. Mostly it is delicious. You can use many different cheeses to top the dauphinoise; I’m partial to Parmesan, but it also works very well with Cheddar. A strong blue cheese would be glorious. As you can see from the recipe, you don’t need very much to create a delicious result. 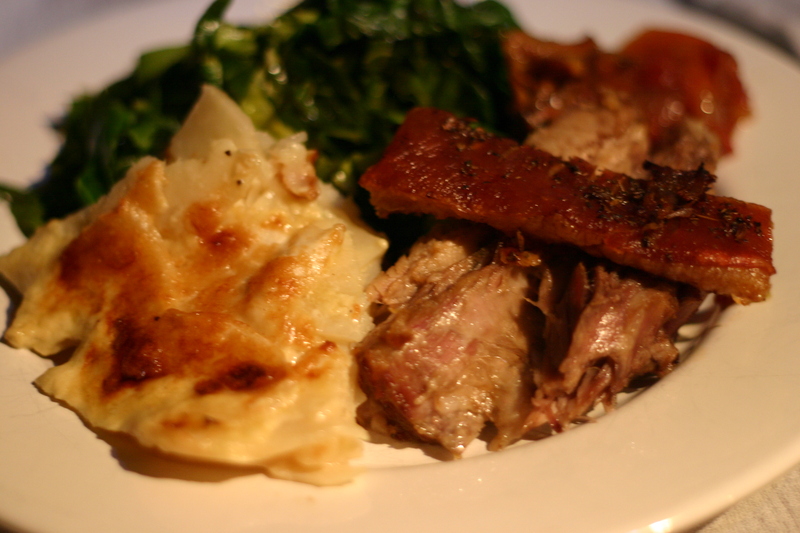 Today’s dauphinoise was served alongside some roast pork belly, some of the vegetables I roasted it on, and some very garlicky spring greens. Bear in mind that celeriac oxidises (browns) like an apple, so if you want to preserve the stark whiteness then have a bowl of water with a squeeze of lemon juice (or cider vinegar) on hand to chuck your slices in as you go. Preheat oven to 200C . 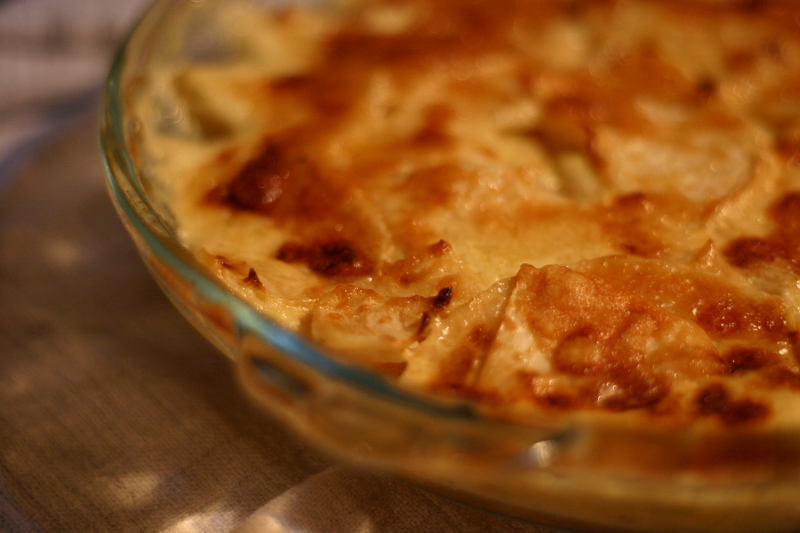 Grease a shallow gratin or pie dish with butter. Peel and slice the celeriac thinly. I usually just shave off slices until it look reasonably clean and tidy. Mix cream and stock in medium saucepan. Season. Add sliced celeriac, draining well if you’ve had them in acidulated water. Bring to a boil and then tip into the greased dish. Give it a shake to level things out (and perhaps a poke or two with a fork) then sprinkle over the Parmesan. ← Welcome to The Cauliflower Capers!